Conversations: Learning and Growing: Do We ALL Have To Make An iMovie At The Same Time? Should We? Do We ALL Have To Make An iMovie At The Same Time? Should We? The end of the school year just snuck right up on me...like it did many teachers (I think). 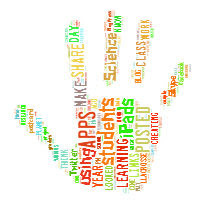 The end of the year is a buzz of excitement, reflection, and review of all the amazing learning that took place. In my science room, I love to close up the year with an Independent Study approach. 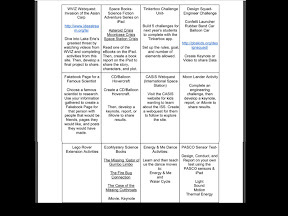 I do this by offering students a menu of 20 topics with various projects attached. These pictures are showing a section of the menu. All of the topics and projects are related to content that we have already delved into with projects we have already explored. And, while there are limits, I do allow students to suggest alternatives to this list, if they so desire. So, for several weeks, my room becomes a flurry of independent (or partner) work to explore content that students are really interested in. Now, truth be told, I still have some students that are not motivated. In just over 100 students, I had probably 5 that needed constant prodding and supervision. This specific menu represents my end of the year mode of operation, but the practice of offering a menu isn't one to use exclusively use at the end. I think that it is a good practice to use year round. 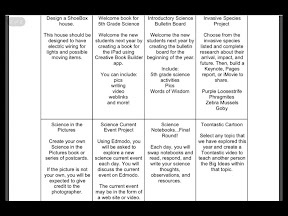 I'm not suggesting that teachers use a 20 block menu each time, but why do we think that we need to ask all students to create the same project at one time? Does every student have to make a poster for this project and a brochure for that one? Not really. What about a rotation of projects? As long as the content is the focus, I don't see a problem in offering various paths. With rubric assessment, we can accurately gauge student understanding. And, seriously...with an iPad in a students hand, the possibilities are endless. There are just so many slick apps to work with! And, more. I'm sure you have your own ideas! So, just a thought...we don't all have to show understanding the same way. And, with a wicked cool tool like an iPad, WOW!